For this month's "Maps Of The Month" featurette, I wish to draw your attention to Shiny's Pooh And Tigger's Hunny Safari (GBC) maps. Tigger and Pooh are out to throw a Thursday Party, but of course you can't have a Thursday Party without honey! (Though really, that just goes without saying, right?) It's time to seek out all the honey pots around the Hundred Acre Wood (which are just scattered about, for some reason)! Pooh And Tigger's Hunny Safari is a portable platformer featuring Disney's version of Winnie-The-Pooh, Tigger, Christopher Robin, and all their friends. Considering it is on the Game Boy Color, its impressive graphics and smooth animation are even more remarkable. Sure, you would expect video games with cartoony characters to be animated well, but more often than not, they are not as fluid as on your TV on Saturday mornings, though this game does an exceptional job. Shiny, no stranger to the Game Boy Color, has mapped this out for all to see, which is good because, let's be honest, licensed games aren't usually known for their quality, but this one at least looks and plays well! Is it "bouncy trouncy flouncy pouncy fun fun fun fun FUN"? Well, it's more so than many other cartoon-based games, at least. 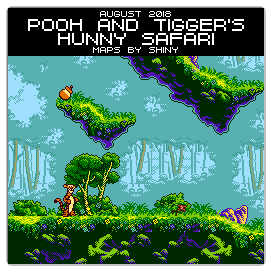 So the recognize the effort put into mapping the Hundred Acre Wood, Shiny's Pooh And Tigger's Hunny Safari (GBC) maps will be known as VGMaps.com's Maps Of The Month for August 2018.